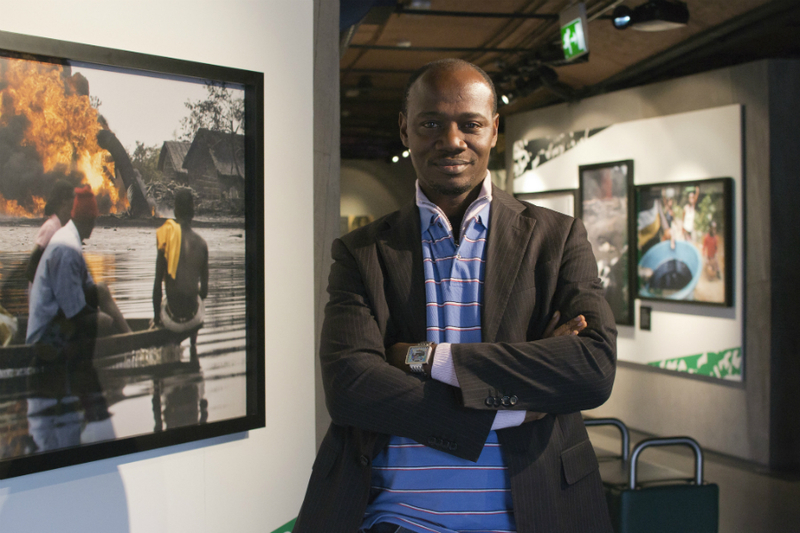 This small but evocative exhibition featuring the work of African photojournalist George Osodi examines the impact of the oil industry in the Delta region of Nigeria. Osodi’s powerful images document how oil has shaped the everyday lives of the Delta population, and the wider consequences of pollution and industrialisation on the Delta’s fragile ecosystem. The mention of oil often conjures up images of smiling Middle Eastern autocrats with their hand on a big tap, twitchy Western leaders and illegal wars (can.open.worms.everywhere.). However, seven of the world’s top ten petroleum producing nations are located outside of the region. Nigeria produces more barrels of oil annually than Iraq, Kuwait, and any other African state, the resource accounting for 80% of total state revenues – yet over half the Nigerian population continues to live in absolute poverty. The Niger Delta has for centuries formed the bedrock of the Nigerian economy – first through its trading posts and central position on the Slave Coast, and then as a major centre for palm oil production. Since vast reserves of crude oil were discovered in the Delta after the Second World War, it has been established as one of the richest sources of petroleum in the world. Something approaching half a trillion US dollars worth of oil has been extracted from the Delta, but on a local level the region appears to be stuck in a time-warp; wracked by poverty and continuing conflict between oil multinationals, the Nigerian government and militant groups such as the Movement for the Emancipation of the Niger Delta (MEND) and the Niger Delta People’s Volunteer Force (NDPVF). The extreme wealth that runs below their feet means little to many of the impoverished Delta population. For many, ‘oil is seen as a curse rather than as a blessing’. The strength of this collection lies in the strong contrasts Osodi generates – bright African prints against the monochromatic backdrop of oil fields and destroyed farmlands, or the organic muddle of tumbledown homes beside the metallic uniformity of the pipelines. Everywhere in Osodi’s photographs we can see the conflict between nature and industry, or tradition and modernity, all connected by the pervasive nature of oil extraction. In some instances this conflict is explicitly violent. A number of intimate portraits show burns suffered by civilians in pipeline explosions, whereas sweeping aerial shots highlight the damage done to the landscape by oil extraction. These two ideas are connected in Skull (2004) which depicts the charred remains of one local killed in Abia state by a pipeline explosion, against the backdrop of once rich farmland reduced to dust. The finger of blame is clearly pointed at the role of major European firms. In many of the photographs, the bright logos of Shell barrels stand prominently amongst the wreckage of burnt out homes or villages. Osodi also highlights the destruction caused by fighting between government troops and Delta factions. In all cases, it is ordinary people who are left to deal with the effects of conflict, either between government and militants, or rival oil companies and factions. Elsewhere this conflict is more subtle, and it is here that Osodi’s photography really stands out. Above all, the significance of oil to the region and its role in shaping the everyday experience of Delta residents is emphasised – women hang washing and dry tapioca, children watch television and do schoolwork, and men read and debate against the continual backdrop of burning oil wells and gas flares. Oil barrels become baths, stoves or drums. Abandoned flow stations become playgrounds. Pipelines run like veins throughout the landscape. In Land Pollution (2004), oil becomes blood on the hands of a local Nigerian youth as he surveys his ruined farmland. In some cases oil is life affirming, in others, the opposite. Osodi’s pictures capture this dichotomy, renewal and destruction juxtaposed. But above all, it is a constant reality to the people of the Delta, one likely to grow ever more central to their way of life. As with previous exhibitions at the International Slavery Museum, such as the recent Lee Karen Stow collection 42 Women of Sierra Leone, the Museum should be commended for offering a floor to politically conscious artists and photojournalists. It is unfortunate though that the exhibition has been crammed into such a small space at the back of the museum. There are only ten mounted wall prints on display, which are supplemented by a slideshow featuring an additional two hundred images. However this flicks through photographs all too quickly, affording little time to appreciate them fully. Despite this, Osodi’s work succeeds in his aim to ‘put a human face’ on the Delta conflict, and to document how people carry on with their lives, and their daily routines against the odds. Osodi’s often troubling but always intimate images capture both the pervasive reality of mineral exploitation, and the resilient nature of the Delta people.